Fast Radio Bursts (FBRs), have made astronomers confused for a long time now. There is still not any generally accepted explanation for this phenomenon. Some consider them pulsars, collapsing neutron stars, evaporating black holes or alien beacons. This will be uncertain until we observe them more and figure out how in space they originate. FBRs are extremely energetic and last only for a few milliseconds. Up till now we’ve been able to spot only 17 such bursts. Although astronomers think that there could be thousands such bursts flashing each day. As reported today in Nature, now for the first time, astronomers spotted one of such bursts. The team has been able to find the origin of these bursts. 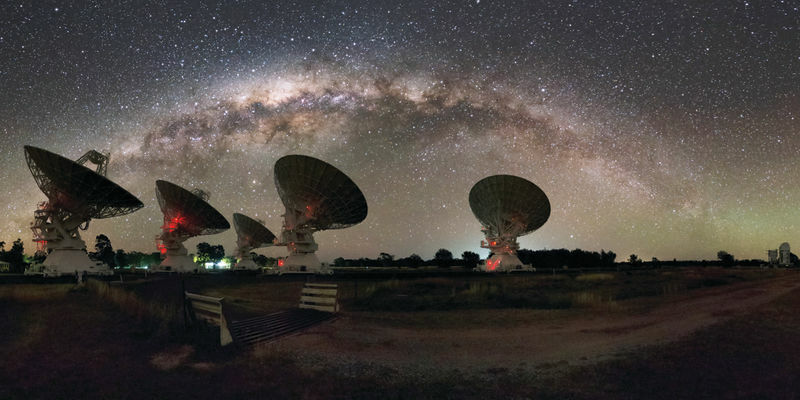 Astronomers working at the Parkes radio telescope in Australia have identified the location of FRB 150418, which emitted energy equal of our Sun’s energy of two days in a fraction of a second. FRB 150418 was detected seconds after it reached the Parkes telescope on April 18th, 2015. Astronomers assembled their telescopes to observe the path of light waves to the FBR’s origin, which is an elliptical galaxy and 6 billion light years away from us. For one, the galaxy FRB 150418 comes from is very old, which allows us to rule out the bright stellar beacons known as pulsars. Keane explained that the radio burst probably originated from the collision of two stars, maybe, two neutron stars. Other evidence, including the afterglow of the elliptical galaxy, endorse the notion that we’re listening to the cosmic scream of two huge objects colliding with each other.